Last day, only Medal Race was sailed. 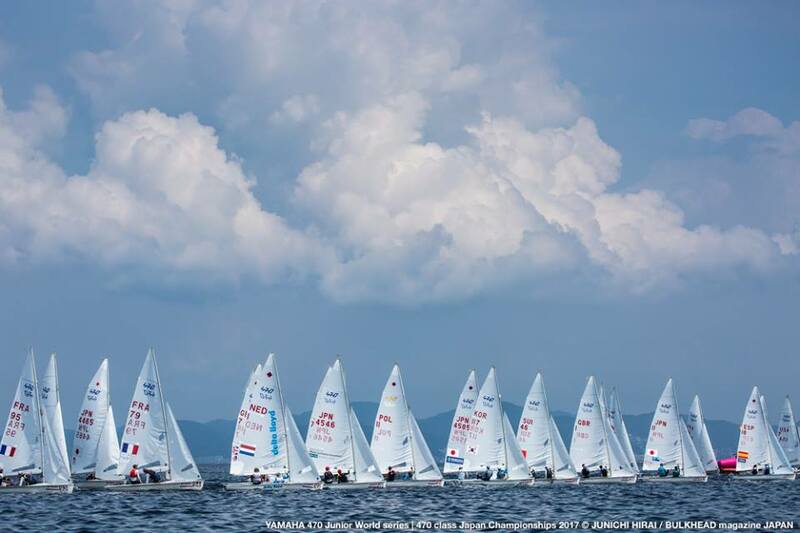 Many sailors who did not proceed to the Medal Race went out on the spectator boats. Many support to the Nippon Boys who are narrowly in front of Belcher/Ryan, the current world champion. On a hot summer day at Enoshima, gentle sea breeze started as usual, however, it did not increase, and the Medal Race started at 13:45 after some waiting on shore. 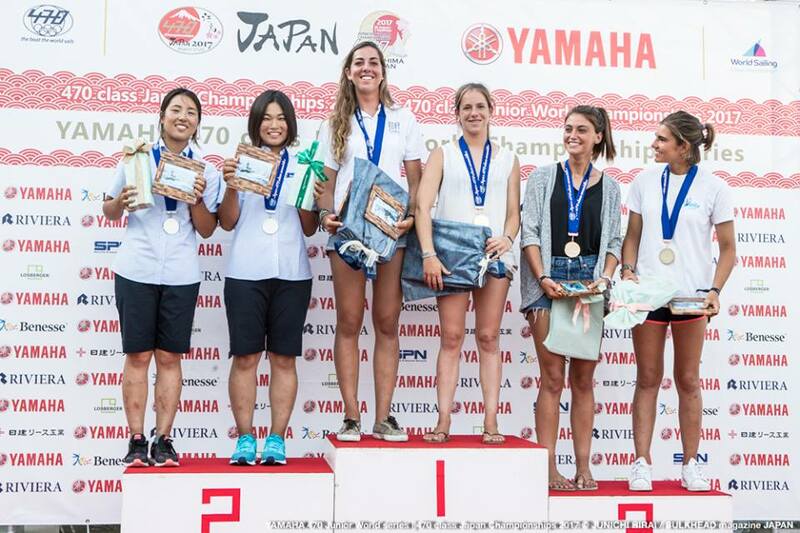 4-5kt of wind filled in the race area, and Demichi (JPN) led to Mark 1. On the run, Isozaki managed to over take Demichi, and rounded Mark 2 ahead. 2nd upwind – course has been shifted to left, and shortened its length. Demichi managed to come back to 1st, and Isozaki was right beind. Everyone was very close, and few PROTEST shouting for the on the water judge. Big drama in the end – Isozaki was in a lead, on the finishing mark side. Somehow, they were late to gybe back to Mark 2, and allow Okada and two other boats to round ahead. Okada finished 1st and also won the 2017 ALL JAPAN title. ‘Great to win! Very happy. I have nothing to lose, so just concentrate to win a race.‘ said Okada. 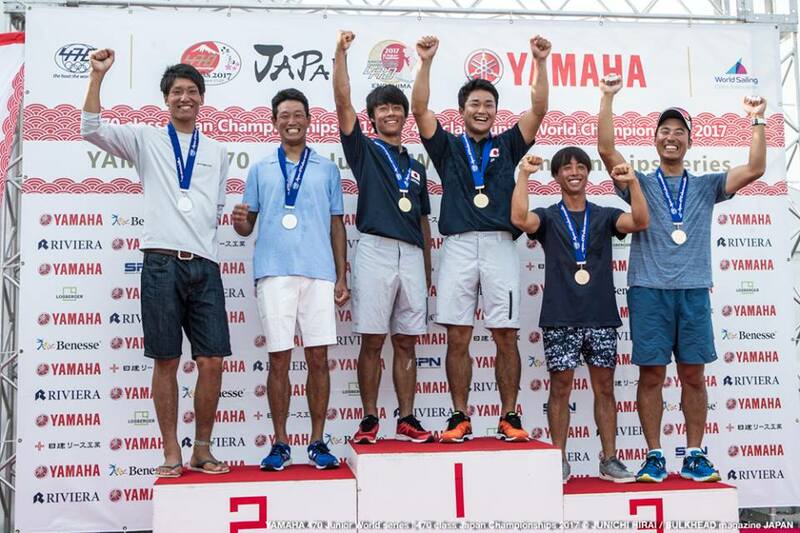 Okada is also the defending champion of the 470 Junior World Championship. He will sail with a different (younger) crew from Aug 28 to Sep 2 at Enoshima. NIPPON BOYS managed to defend the ALL JAPAN title from the Olympic and World Champions and medalists. Many sailors, friends and families went out to watch the real medal race – so many RIBs were full. To overseas visitors and competitors, thank you for coming. To Japansese teams, more training and come back next year. See you again in Aug 2018.